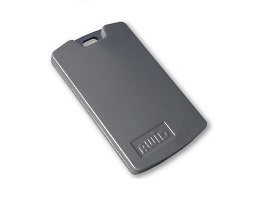 AWID’s KT-UHF-0-0 hand-held keytag takes hard usage in a rough environment. It hangs by its integrated metal tab on a keyring or keychain or small hook. It is thinner than a modern car key, and so it takes little space when combined with typical keys and carried in a pocket or bag. The KT-UHF keytag is perfect for gripping between fingertips when it is aligned with an AWID long-range reader, or for hanging loose like a keyfob as it is moved past the reader. Use it also for access to doors when walking in a building with UAxcess readers.